With other sports, you might be able to decide on your footwear as quickly as you can pick running shoes. With soccer cleats, you can’t just buy on impulse. Shopping without prior research is a big risk you probably don’t want to take. If you have wider feet than the average player, you’ll quickly feel the discomfort and regret. It’s not so hard to find what fits you nowadays because brands make cleats for specific purposes and specific feet variations. Read on if you’re looking for the best soccer cleats for wide feet. Soccer is probably the only sport that demands a lot from a player’s shoes. Not to downplay other sports and shoes, but every soccer cleat has some high standards and expectations to attain to be even slightly useful. If you have wide feet, then a normal soccer cleat probably will not work. They’d probably end up stretched out of proportion or completely ripped at the sides and in front. What you need are soccer cleats like the ones we’ve listed here with a little bit more width or elasticity in the right places. 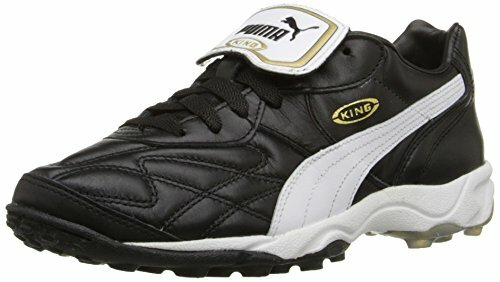 PUMA Men’s King Allround TT Soccer Cleat is our best overall cleat for wide feet. One of the first and main things it’s praised for is that it’s accommodating to players with wide feet, as evidenced by a lot of good reviews about that particular feature. Many players who have wide feet have commented on its comfortability. It is possible to wear these even if your feet are not wide. You could just size down for a comfortable fit. It is good to know these are sized specifically for people with wide or bulky feet. This can be credited to about three of its features. One is its 100% Puma Lite leather upper that provides a convenient yet firm flex for wide feet to mold onto. The lace system and the foldover tongue also allow more possibility for customization so you can achieve the so-called snug fit of soccer shoes. It might also look more like running shoes than a soccer cleat at first sight. It is larger than what we’re used to seeing in new cleats coming out just now. That’s because this one wants to cater to people with wider feet, either horizontally or vertically. The Puma Cell cushioning also gives more comfort all around from the quilted vamp to the rubber sole. However, this doesn’t affect the ball control at all as many have claimed these shoes deliver some powerful shots despite of the bulk. It’s not the prettiest compared to a lot of other soccer cleats that use more modern designs, but it has the classic elements that are reminiscent of old-school soccer cleat styles. We don’t see the fold-over tongue as often anymore or the bulky quilted upper and yet those are incorporated into this cleat cleanly. Named the “King,” this model is an icon from the brand and it performs just as it says. 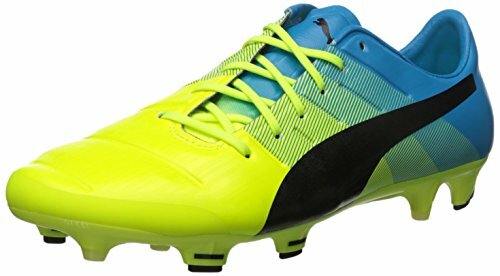 PUMA Men’s Evopower 1.3 FG-M is a soccer cleat that has a reputation for being for wide-footed players. It’s known for its medium to wide fit, even when it’s fresh out of the box. It is true to size only if you have naturally wide feet because that’s what they’re made for. You wouldn’t notice it at first because its flatter and smaller appearance from the outside doesn’t give us any hint of the wider space that accommodates wide feet on the inside. Yet it does have space and so much of it that you don’t really need any time to get it molded to your feet. This second generation of Evopower cleats, the Evopower 1.3, comes close to the hype of the launch of the Evopower itself. It goes back to its roots as it incorporates some features and minimalism, design and functionality-wise, of the original Evopower. It’s considered to have a “hybrid” function because it combines and excels in both power and speed. This boot is more for attacking players who have wide feet. More than anyone else on the lineup, forwards and strikers are the best bet to benefit from these because of the extreme comfort even from the first wear. At the same time, players can perfect the ball touch. For something that has more material on the sides from the added width, this one is light and makes use of the modern technology’s microfiber to make it happen. There’s not a lot to be critical of with these shoes as they’re clearly made to get the job done for players with wide feet. Considering they perform so well and are equipped with the right amount of comfort for wide feet, we can probably say they’re the best cleats for the money. You’ll get so much wear out of them without having to retire them early at all. The New Balance Men’s Visaro 2.0 Pro from New Balance is opening up the world of beautiful and high quality soccer cleats to more people, and by that we mean people with wide feet who normally have a harder time finding cleats that fit their feet or people with much stricter budgets. From its name, you can tell this is no boot for the not-so-serious player. It has “Pro” in its name after all, but the price despite that reputation is pleasing, making it the best cheap cleats you can get. From New Balance’s own silo, it says they’re “engineered for creative players” and that means it’s really made for those who employ various techniques throughout the game. This could mean being in possession of the ball, defending the goal, or in assisting their teammates. It can be an all-around cleat because it’s also suitable for strikers. The intention is to make it comfortable as in a “moccasin construction” while also putting into it the control and stability that’s a Visaro classic into the strike zones on the upper. What makes this truly unique and special to players with wide feet though is the shape of the cleat. It makes it most beneficial to them. Many would identify its width as unusual because it doesn’t seem so proportional with the length. It all comes down to design. The shape of the shoes are unique to its own. It gives your foot more space on the instep of your foot from the inside. It’s bent in places where it should be straight and straight in areas it should be curved. The shoe bends from the small toe to the big toe. Also, where there’s usually a curve for the inside of your feet, it’s just straight from the heel to the big toe. The result is that it follows the natural bend of your forefoot to the ends of your toes and it gives more space on the side. The usual Visaro 2.0 Pro could be considered medium width, which will be suited for people with just a little bit more width to their feet. That’s usually the hardest to find shoes for because cleats only come either as a normal conventional boot or one that’s for people with really pronounced wider feet. This one bridges that gap. However, they have an even wider fitting option which you can choose if necessary. Now that’s attention to detail and inclusivity that we’re looking for and they offer it in such generous affordability. So far, we’ve only featured soccer cleats that look like running shoes or new iterations of old models and designs. There’s nothing yet that looks minimalist and like the classics from the past. Nike Mens The Premier Soccer Cleat fills that space. You can’t get more classic than this, at least in looks. The black-and-white cleat looks so much like a throwback cleat, something that resurrected from the past. Only, it’s from recent past and it incorporates new technology in its features that can only be from recent years. As a plus, it’s made mostly of leather – authentic kangaroo and goat leather, to be exact – thus having flexibility as a prominent quality in its entirety. This may not be labeled as being for people with wide feet but the materials, especially for the upper, are extremely soft and mendable. 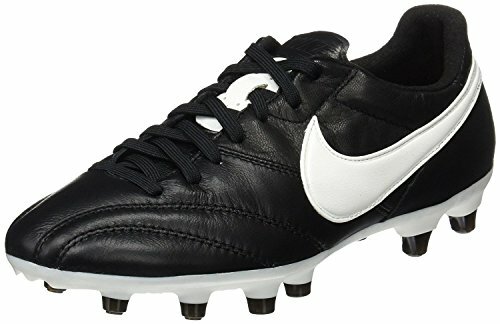 In this way, even if we can’t point this as the first choice because it’s a normally-sized soccer cleat with no indication of being for wide feet, they’re still suitable for the high quality leather that Nike almost always nails. When you touch the leather, it folds and caves in to your touch. When that’s the case, you can’t possibly imagine how buttery it will feel like if your foot touches it from the inside and it molds to your feet as you play with it again and again. However, some people have commented on it being sized smaller. In this case – and it’s important to note that this might be an isolated case that refers to these shoes only – you might want to size up than your normal just enough to fit your foot and be comfortable. Being that it’s also equipped with Nike’s The shape will follow. 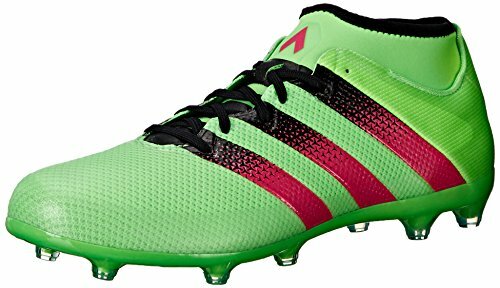 We don’t really have to introduce adidas Performance Men’s Ace 16.2 Primemesh soccer cleat. The brand is known and so is the series it belongs in. Adidas’ Ace wouldn’t have lasted this many revisions if it wasn’t as promising as people’s hyped reaction to it proves. This is another cleat that is true to size in the medium-wide fit category. It means they’re proportional only if you have feet that are a little bit wider but not completely wide. Nevertheless, we have to regard this as the best wide-fitting soccer cleat. It may not be made of kangaroo leather, which is what’s deemed best for molding to your feet, but they’re made of primemesh knit that is unique and is an original invention of Adidas. This material is popular for their sock-like fit. It perfects the snug fit standard of soccer cleats because there’s nothing that feels more snug than a sock and this one imitates that feeling. It might look firmly structured from the outside, but it adapts to the shape of your feet as promised. In addition to the already snug feel of the material, the laces and TechFit collar around the ankles make sure the shoes have a locked-in fit everywhere else. For the width, you might want to take note that this has more width towards the front of the shoe more than the middle or the back. This caters to players whose wide feet are specific to the front area, but it’s not necessarily selective in the positions it’s compatible with. No matter your position, the all-around features that focus on stability and power are beneficial whatever your job on the field is. If you have wider feet, you don’t just want to hastily pick up any old pair of soccer boots. Regular cleats won’t fit right and will wear quicker. Instead, focus on selecting a pair that fits properly, and the cleat will last a lot longer. Having wide feet is almost always one of the reasons why shoes don’t last as long as they could. The usual time of wear and tear significantly shortens and it only takes a few wears before the upper opens and can detach from the sole. When you have wide feet, it’s always a factor to consider when buying shoes, but it’s even more detrimental when it’s soccer cleats you’re shopping for. In soccer, cleats are a huge factor to how players perform. Each cleat has a purpose that depend on players’ positions, the field they play on, personal preferences in features, and many other factors. It’s the same way with people who have wide feet. They need a cleat that’s specific for them because soccer cleats have a strict requirement of being exactly fitting. You can’t pick a soccer cleat that’s one or even just a half size larger. Focusing on the best soccer shoe for wide feet does NOT mean just buying a size larger. It needs to fit exactly and literally like a glove wherein there’s as little to no air as possible between your skin and the material of the interior. That’s how players feel and control the ball with great accuracy. Soccer cleats are supposed to be sized exactly as your feet in length and width but not every pair of feet are the same. Since this is the case, a lot of soccer cleats, especially the kind made with authentic leather, are moldable through time and constant wear. However, not all are made to endure constant pressure when the width of the feet is especially larger than normal. When a soccer cleat is labeled as being for people with wide feet, it means they’re not sized as normal soccer cleats would be. The upper is probably already wider in comparison to others even before the first wear, or it’s extremely stretchable so as to avoid having to retire the shoes early. If you have wide feet, you’re already accustomed to being selective when it comes to shoes. In a way it’s a bit easier with soccer cleats because brands already tell you if a pair is for people with wide feet. You’re less likely to regret a purchase and maximize the use of your cleats for a long time if you get the ones already labeled as such. At the very least, you know it’s made with intention of you being the user. Soccer cleats for wide feet are getting quite popular because there’s a serious need and demand for it. Many soccer players apparently need this distinction and it’s helpful to shorten the amount of time it takes to filter out the cleats that are not suited for these people. However, like not all soccer cleats are suited to everyone, not all soccer cleats for wide feet are not going to be necessarily suitable to every player with wide feet. In some cases, even cleats that are not labeled as being for wide-footed players may turn out to be unexpectedly great for them. Compatibility of soccer cleats to players with wide feet doesn’t always have to depend on the label that brands put on them. It still comes down to certain features that allow soccer cleats to accommodate wide feet without showing signs of tearing apart after just a few times of wearing them. You probably adjust your choices of soccer cleats based on their ability to adapt and mold to your feet. That ability is most crucial if you have wide feet because you need something that can endure the expansion without losing effectiveness or firmness. Your shoes are highly likely to expand and stretch out because there will be more pressure from the sides, therefore elasticity is on top of the requirements that you should look for in the materials used especially for the upper. Leather materials are made differently and come from different sources. The most highly-regarded among them is the authentic, 100 percent leather that comes from kangaroo or calf. The first is more common among soccer cleats. This kind of leather is what’s most suitable to players with wide feet. It provides the elasticity your feet will need without being uncomfortable at first or becoming too loose as time passes. Kangaroo leather in particular is the one that’s able to mold to your feet. Other kinds, like synthetic leather, can still be firm and unwavering even after a few times of wearing them. Authentic leather, however, is one of if not the most expensive in the market. They hold a lot of value, from the difficulty of production and the high quality of the material. This is more suited to people with wide feet who are also serious about playing soccer, whether professionally or just for the long-term. It’s a big investment that’s worth every penny if you’re going to get the best use out of it. Nowadays, there are only two kinds of uppers soccer cleats are made of: natural and authentic leather or synthetic material, and there are various kinds of the latter. In general, synthetic soccer cleats are usually more structured and less adjustive to your feet. However, technology has enabled brands to be more innovative in producing synthetic materials that can imitate the elasticity and quality of real leather. To some level, they could be suitable for wide feet. We have had iterations of soccer cleats made with knit or mesh materials and sometimes, they’re more preferred for their cheaper price yet comparable quality. Going for synthetic might be a more practical choice for players who don’t do soccer often. It also might be for those who are looking for soccer cleats that won’t be a pain to wear in the few occasions when they need one. This could also be the choice for kids with wide feet who are switching out shoes every once in a while as their feet grow larger. There’s one rule when buying soccer cleats that you should try to never break: don’t buy oversized soccer cleats. It’s pretty easy to follow considering cleats usually have half sizes to accommodate people whose sizes fall awkwardly in the middle of two whole sizes. Even then, that usually doesn’t immediately solve it for people with wide feet. The sizing for soccer cleats that are specifically made for wide feet may not necessarily be the same as the sizing for normal soccer cleats, just as their construction are different. It’s best to know the equivalent dimensions of the shoes according to size, either from people who have already bought the item or from the brand’s size chart if it’s available. In the process of buying soccer cleats, you’ll encounter the term “snug fit” many times. This is crucial if you want to perform your best in games because anything other than this will most likely reduce your capacity to play well. Shoes protect your feet and they may improve your performance, but can’t compare to the confident accuracy of being barefoot. That’s what cleats are trying to achieve and fulfilling the snug fit requirement is a way to do that. You’ll know it’s a snug fit when the cleats are not too tight that they’re painful nor are they too loose that your feet move around inside the shoes. Both are disadvantageous, but they’re two things that players with wide feet might be constantly hassled by. Most shoes would tend to be narrower on the sides but exact in the front and back, while the alternative would just be the opposite of that. It’s not advisable to compromise one for the other as each circumstance has its own negative effects, either pain or sloppy play. When looking for cleats for wide feet, make sure this snug fit is a quality that it can provide for you. Wide feet are almost always the first reason for early retirement of shoes. This may happen even before you get back your money’s worth from the number of wears you get out of them. At least with soccer cleats, the ones made for wide feet are already primed for the brunt they’re going to take from the extra width on the sides. However, not all are designed to last the same way. These soccer cleats don’t wear out the same way. Some are going to give out in the obvious and inevitable manner most shoes do. Some will just loosen up to the point of uselessness on the field. They might look just as they initially did on the outside, but they won’t have the same snug fit as before. Durability in soccer cleats for wide feet takes form in the ability to comfortable and snug for the player throughout his or her possession. A specific wear and tear that it should be equipped to prevent is the immediate change in fitting. We know the struggle of finding shoes that won’t easily back down from the brunt of wide feet. Shoes for wide feet should seriously be a style of its own everywhere they sell shoes. Good thing is, when it comes to soccer cleats, they’re almost treated like a separate category altogether apart from other cleats. These picks don’t all fall into it. 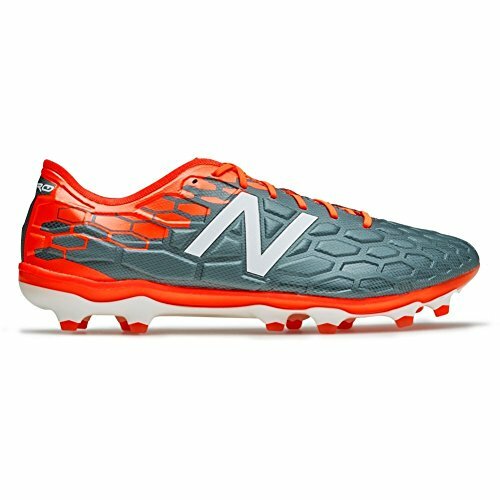 Hopefully, our recommendations along with the defined features of what to look for in cleats for wide feet makes you more ready to pick your most comfortable, most fitting, and most enhancing soccer cleat to date.